So we wrap up the stories of all the other characters that left the prison [spoilers!]. Beth and Daryl are together. They try to find some traces of the other survivors, but only end up on some zombies eating leftovers. Lizzie, Mika and Tyreese try to make the best of it. Lizzie is now truly showing her crazy side. Luckily Carol shows up just in time to save Judith from being suffocated. Oh ya, baby Judith is alive! Bob, Sasha and Maggie are together. Maggie is on a mission to find Glenn and Sasha and Bob follow her to keep her safe. Glenn is still at the prison. Why? He collects supplies and leaves the prison. On doing so, he finds Tara by herself and takes her with him. In the end, we have a big introduction to some new characters. 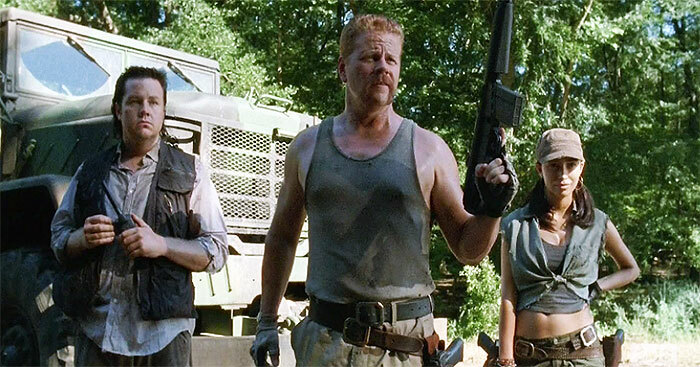 Abraham Ford, Eugene Porter and Rosita Espinosa.